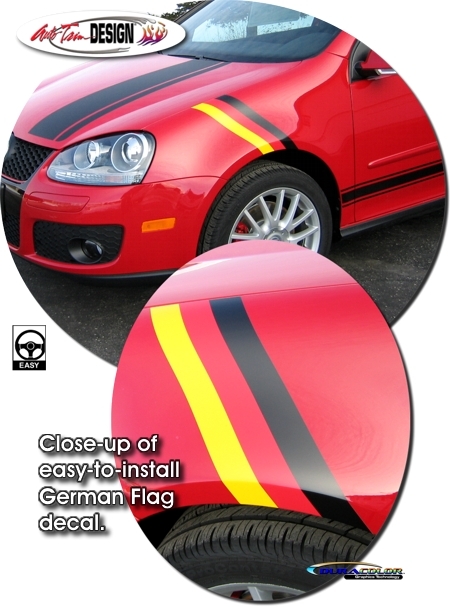 Dress up your Volkswagen GTI with this unique tri-color (Black, Red & Yellow) German Flag "Le Mans" Style Racing Fender Stripe that can easily be installed on either the Driver side or Passenger side front fenders - or order two (2) and do BOTH fenders! While stripe is shown on a GTI, it can be installed on just about any vehicle. Graphic kit requires slight trimming (length) at time of installation. Easy to follow general online application and care instructions are included. Graphic kit requires slight trimming (length) at time of installation.